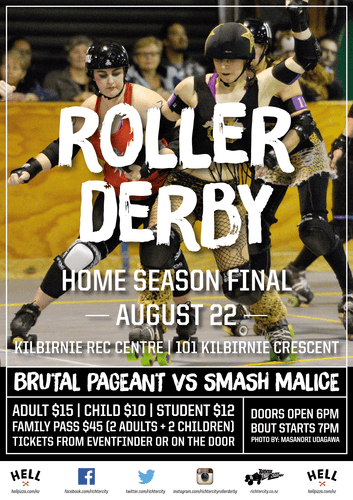 This one's bound to sell out - don't miss out on limited spots for Richter City Roller Derby league's 6th home season final! The disgraced beauty queens of Brutal Pageant and the trailer cats of Smash Malice will face-off in a no holds barred rematch of last year's final. After beating 2014 champions Malice by just 3 points back in May, Pageant will be gunning to recapture the cup that's evaded them since 2010. Now in its 7th year, Richter City boasts three home teams, made up of members of the NZ#1 ranked All Stars and NZ#3 ranked Convicts (development team). Wellington is the premier location for derby in New Zealand and spectators will have to get in quick for the limited number of seats available.